The Nonin Avant 9700’s simple functionality, quick recharge, and extraordinary 115 hours of memory makes it well-suited for a multitude of applications. 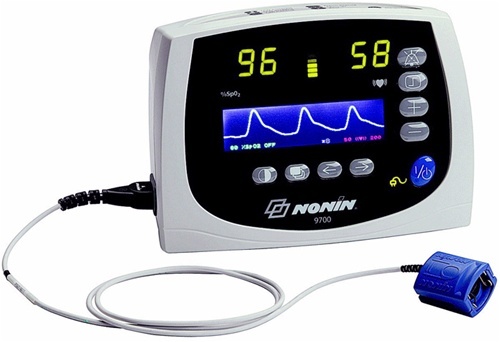 The Nonin Avant 9700 combines flexible alarm options, unparalleled non-volatile memory, and Nonin’s time-honored technology to give you an easy-to-use and efficient monitor. The plethysmographic waveform alters color as a real-time reflection of the patient’s pulse signal quality — alerting you to patient changes. The high-resolution color display compliments the signal quality indicators and LED values. Flexible alarm management options feature locked, latched, unlatched and recall for customizable patient settings. Easy to Interpret - Clear LED display, color coded status indicators waveform that changes color, shape and size when Sats drop! Click the button below to add the NONIN AVANT 9700 DIGITAL PULSE OXIMETER WITH WAVEFORM to your wish list.